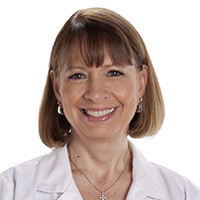 Dr. Michele Carpenter is a breast surgeon who sees patients in the Orange office, and performs surgery in community hospitals and local surgery centers, including St. Joseph Hospital of Orange and Saddleback Medical Center in Laguna Hills. She has dedicated her entire professional practice to breast cancer diagnosis and care, and uses a team approach to care for both the mind and the body of her breast cancer patients. She is board certified in surgery. Dr. Carpenter earned her medical degree from Georgetown University. She then completed her general surgery residency at Balboa Naval Hospital in San Diego, after which she spent one year aboard the USS Acadia as the chief medical officer, and served 10 years in the U.S. Navy. After her military work, Dr. Carpenter was the Breast Program director at Scripps Clinic Medical Group, where she worked for 11 years. She was also a clinical instructor and lecturer for the state-funded Breast Cancer Early Detection Program’s Proficiency in Breast Examination Course; a clinical advisor and consultant for clinical breast protocols for the cancer detection section of the California Department of Health Services; and a board member of the American Cancer Society Breast Health Initiative team. She was also president of the San Diego Society of General Surgeons and the San Diego Surgical Society, and is the immediate past chief of staff for medical staff at St. Joseph Hospital. In addition to her current work with UCLA Health, Dr. Carpenter is the breast program director at St. Joseph’s Center for Cancer Prevention and Treatment in Orange. She continues to act as a reviewer and a member of the Ultrasound Committee for the American Society of Breast Surgeons, and has coauthored and participated as the principle investigator for several studies on intraoperative radiation therapy for breast cancer, and cooperative group trials. Dr. Carpenter lives in south Orange County. She is married with three daughters, who live in Irvine, Minneapolis, Minnesota, and Oak Harbor, Washington. When she’s not working, she loves to travel and spend time with her family. Breast cancer is one of the most common types of cancer in women in the U.S. Once breast cancer occurs, cancer cells can spread to other parts of the body, making it life-threatening. The good news is that breast cancer is often found early, before it has spread. To diagnose a breast condition, your healthcare provider will take your complete health history, examine your breasts and may order imaging tests or a biopsy.